Late last year, I gave up my career as a museum curator to become a stay-at-home mum and freelance writer. Fulfilling my role as a full-time mum to 10 year old Amir and 4-month old Arif has not been without its challenges, but I wouldn't have it any other way. My husband has done a great job supporting me, but I really don't know how he would cope with looking after the kids and holding down the fort if I were to go away for a few days. This is precisely what the producers of Mom's Time Out wanted to find out - What would happen if the woman in the household disappears and the man takes over? Exploring the idea that being a mom is an attitude and not just a biological relation, three families from Singapore, Malaysia and the Philippines are put to the test in a role reversal social experiment. In the reality show, which is Lifetime's first Asian production, the three moms take a 5-day holiday in Vietnam together, leaving the dads to manage their kids and household. The five half-hour series showcases the interesting and sometimes funny results when these typically hands-off dads are left in charge. The tune in, catch the show as it premieres on 28th August 2014 and when it airs on Thursdays at 9 pm (SIN/HK) on LIFETIME™, which is available on Astro Ch 709. So will dad step up or give up? But that's not all! 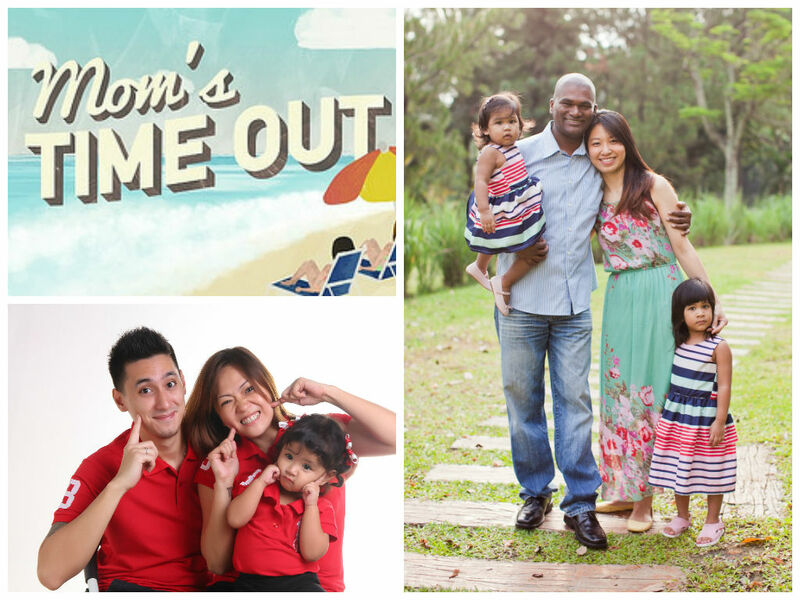 When you tune in to Moms Time Out, you stand a chance to WIN a 3D2N stay at Angsana Lang Co, Central Vietnam! Just download the ScanAd app on your Apple and Android devices. Open the app and scan it while watching the show to access more content on Mom’s Time Out. You can also share and learn opinions from other parents when you take part in the weekly discussion on the app! In my last post, I wrote about spending an anxious Hari Raya. But I'm very happy to share with you that it's all over - Happy days are here again! To recap, a few days before Raya, Arif had a routine cranial ultrasound and the doctors believed that saw a subdural effusion (collection of liquid) on the outer layers of his brain. Since learning that my 3-month old preemie baby could possibly have hydrocephalus or worse meningitis, I became numb and just went through the motions on autopilot. On the 3rd day of Hari Raya, we brought him back to the hospital, where Arif and I spent the night. Beginning 4.00 am the next day, I was meant to stop feeding him to prepare him for his MRI scan at 8.00 am. However, since I was breastfeeding and Arif often feeds a little at a time, I wasn't prepared to let my son cry bloody murder from hunger. I chose to ignore the doctor's orders and followed my gut instinct. I fed him for as much as I could until about 15 minutes before the MRI. Seeing him go through the entire MRI process was rather unnerving. I fought back tears as my son was loaded into this scary-looking machine. The scan took about an hour, but the wait afterwards was just the worse. My husband had to go home as he wasn't feeling so well, so I waited alone for the doctors to come and tell me the results. I didn't hear a word until about 5.45 pm, when the doctors did their evening rounds. I could hear them discussing my son's case on the other side of the curtain, and waited in agony. I wasn't sure if the results were back yet and quite possibly I would have to spend another night at the hospital agonising over what could be. Finally, the senior doctor pulled back the curtain and asked if I've heard the results. I said, "No." She smiled and said everything is fine with Arif, the MRI didn't find anything wring with him at all. I was so relieved and happy, but at the time I was mostly in shock. The senior doctor was very kind and she said she understands exactly how I feel. She instructed the other doctors to discharge Arif right away so that we could go home. She seemed disappointed that I had to wait so long for the MRI results, she looked around at the other doctors in disapproval and lectured them for a bit. Anyway, that evening we went home and that weekend we took Arif out :) I am so happy that my son is well. This is the beginning of wonderful times ahead for my family. PS: The MRI did confirm that Arif has a cyst in his brain, which is a scar left behind by the Grade II intraventricular hemorrhage (IVH) that he suffered at birth. However, this is nothing to worry about, according to the doctors, as the bleed has healed. Usually, Grade II IVHs don't cause long-term effects to a baby's development.